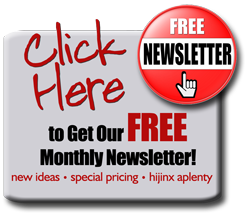 Drastically Increase Your Cash Flow by $10,000-$20,000! to bring your customers back during traditionally slow times. We’ve seen response rates upwards of 56%, with 35% being the norm… This is a VERY simple, yet effective, program because your guests love the idea of getting something free, as well as the excitement generated while the envelope is being opened by your server! Determine Your Number of Envelopes. Calculate how many tables you’ll serve between November 25th and New Year’s Eve. The minimum amount is 1000, with some of our restaurants electing to print over 10,000. Why so many? Once your guests realize the potential of the prizes they can win, some will re-visit your restaurant 2 and 3 times during the ‘hand-out’ stage to increase their chances of winning. Determine Your ‘Prizes’. Prizes can range from a $100 restaurant gift certificate to a Free Soft Drink… we have printed over 1 million envelopes, so we can help you decide your prizes if you need some help. Determine How Many Winners of Each Prize. Once you pick your prizes, then decide how many of each prize you would like us to print. The higher the prize value, the lower number of those certificates should be printed. In fact, in the case of a $100 gift certificate, you may only want one… and that’s fine. The goal is to print minimal high amount prizes, and a majority of the mid and low value prizes. Receive Your Envelopes & Hand Them Out. We’ll print, stuff and ship your envelopes to you according to your hand-out period (usually from Thanksgiving to New Year). Your server (or cashier at the register) will ask your customers if they would like to participate in your ‘No Peeking Promotion’. They explain that all the guest has to do is come back in January with the UNOPENED envelope and find out what they won! Your server can also hint that they can come back multiple times during the hand-out period to collect as many No Peeking envelopes as they want…. which not only guarantees your business will increase in December, but also in January as the guests keep coming in with their unopened envelopes to see what they’ve won! Sit Back And Reap The Benefits. During the month of January, you’ll be flooded with customers redeeming their No Peeking envelopes! In order to participate, the envelopes must be opened in front of their server, and there is only one envelope per table allowed. 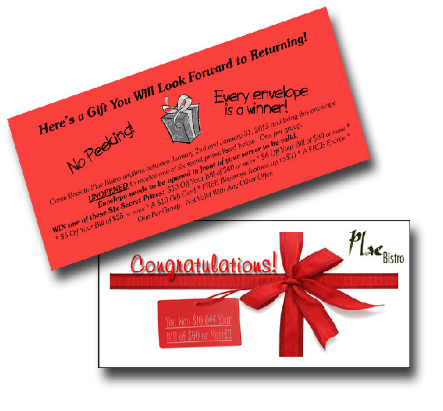 Since most of the prizes won are low value, you’ll typically only be giving away a free appetizer or free dessert, while your customers purchase their dinner… and THEY’LL KEEP RETURNING ALL MONTH until they’ve gone through all the envelopes they collected – each time with a different envelope, hoping to win the BIG PRIZE! The goal is to bring back the customers who already know and love you… during your typically slow times. The process for auto shops is more mail-driven than restaurants, but the end result is the same – drive your best customers back through your doors. Pick Prizes. What will bring customers back through your doors? Pick prizes from an oil change up to a larger ticket item (like a iPod) – give them a reason to return! Connect with Your Customers. We’ll handle all the printing and mailing. 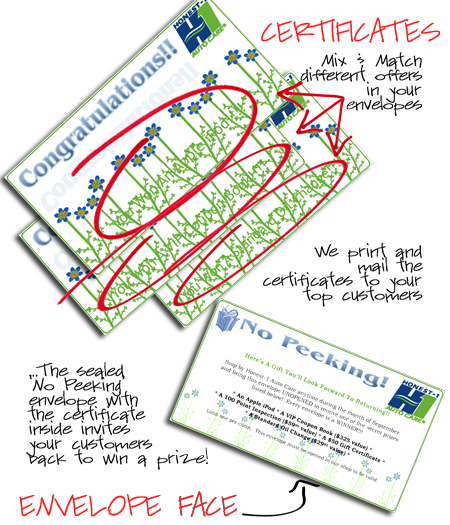 We send out sealed ‘No Peek’ certificates in regular envelopes containing a letter of explanation to your current customer base, inviting them to claim their free prize. No Peeking! Customers can’t open the envelope until the redemption period. No peeking allowed, or their prize is void! Give ‘Em a Reason to Return. The envelopes have all the possible prizes printed on them, giving your customers incentive to return. Everyone wins! Bring ‘Em Back. Customers return during the redemption period with their sealed envelopes to redeem their prize. The chance to win at least one big-ticket item generates enthusiasm and a loyal, lifetime customer! Send Me More Info On No Peeking! Fill out the information below or give us a call at (517) 548-5315 and we will send you more information on our No Peeking Program!